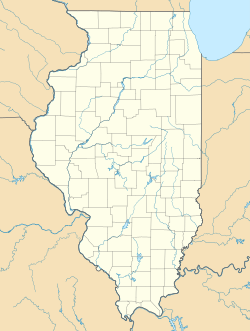 Mulkeytown is located 309 miles (497 km) south of Chicago (via I-57 south to IL 14 west), and 95 miles (153 km) southeast of St. Louis (via I-64 east to US 51 south to IL 14 east). Mulkeytown is located on Illinois Route 184, 3 miles (5 km) west of Christopher, in Tyrone Township, in the west-central portion of Franklin County. According to the U.S. Census Bureau, the Mulkeytown CDP has a total area of 0.276 square miles (0.714 km2), of which 0.423 acres (1,713 m2), or 0.24%, is water. Centennial & Sesquicentennial Farms are those family farms that have been held within a family for more than 100 or 150 years. Mulkeytown Grade School (Closed 1987 & consolidated with Christopher Elementary School) - Now re-purposed as the West Franklin Historical District and Genealogical Society. ^ a b "Geographic Identifiers: 2010 Census Summary File 1 (G001), Mulkeytown CDP, Illinois". American FactFinder. U.S. Census Bureau. Retrieved May 4, 2016. ^ "American FactFinder". U.S. Census Bureau. Retrieved 15 March 2011. This Franklin County, Illinois location article is a stub. You can help Wikipedia by expanding it.